SAVE MONEY When You Order All Three! The TouchMoney Program uses a proven kinesthetic approach to make learning to count coins quick and easy. Based on the idea that all coins except pennies can be counted using 5's, this step-by-step process helps students of all ages experience success with this essential life skill. Each component of the program is sold separately or may be purchased in sets or as a complete kit. TouchMoney Worksheets has been revised and updated to include expanded lesson plans, over 50 additional reproducible worksheets, new activity ideas and games, and assessments. Learning to count by 1's and 5's and to recognize money symbols. Identifying each type of coin and its value. Learning the location of TouchPoints on each type of coin. TouchCounting coins using marked TouchPoints. TouchCounting coins without the TouchPoints drawn on the coins. TouchCount Shopping: TouchCounting coins to buy various real-life items. Each lesson includes reproducible activity sheets and extension activities. 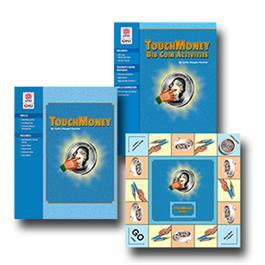 A Money Games section is provided for additional hands-on TouchCounting practice. In the TouchMoney Game, students practice finding the total values of various groups of coins shown on draw cards (with TouchPoints) and realistic coins (without TouchPoints) drawn from the money tray in the center of the game board. Players TouchCount no more than six coins at a time. Total values do not exceed $1.00. Includes the components listed above and a money tray. Game Includes: Game Board, Teacher's Guide, 100 Plastic Coins, 60 Draw Cards, Dice, and Playing Pieces. Students use the 28 large punch-out Big Coins (included) to complete the activities. Big Coins with and without TouchPoints are provided for the nickel, dime, and quarter. Since pennies are not counted using TouchPoints, only one set of pennies is included. The 16-page Teacher's Guide includes extension activities, game ideas, and reproducibles for teaching and reinforcing the TouchMoney process.